Andy Warhol’s celebrity portraits based on mass-media photographs are among his most recognisable works. From 1962, Warhol abandoned hand-painting for screenprinting, preferring a ‘manufactured’ aesthetic. The Elvis Presley he presents here is not the hip-shaking musician, but Elvis the actor playing a role in the 1960 movie Flaming star. Warhol produced this painting for an exhibition in Los Angeles – the home of America’s entertainment industry. The metallic background references the silver screen, while the multiplied image creates a sense of cinematic motion. This visual repetition also comments on the constructed nature of celebrity. Warhol shows us that Elvis the man has become a mere product, a mass-marketed idol cast as a popular stereotype. This work also appears in the adult (7-12) audio guide, available for rent. 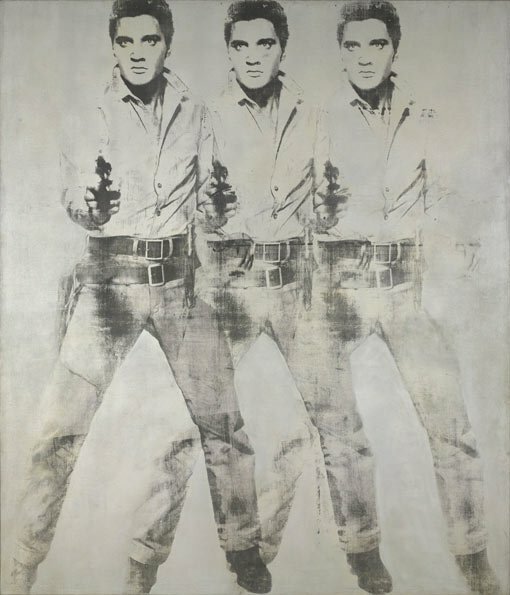 How has Andy Warhol portrayed Elvis Presley in Triple Elvis? Do you think this is a good portrait? Discuss your point of view, taking into consideration both the aims of the artist and your response to the work. How do you think audiences of the time would have responded? What is a ‘manufactured’ aesthetic? How is it relevant to Warhol’s practice? Does this approach push the boundaries of art? Is American pop art a celebration of popular culture or a critical commentary on how consumerism and mass media reshaped the American way of life? Debate in class. In 1962, following several years of tentative and dispersed experimentation, pop art fully emerged within the New York art world. Before the year was out, all the key figures – including Andy Warhol, Roy Lichtenstein and Tom Wesselmann – had held solo exhibitions of pop work. Their radically new style polarised commentators. On the West Coast, a regionally nuanced pop art was also taking root. The subject matter of American pop was overtly familiar and often commercial. Artists represented imagery and objects from the world around them – print media, supermarket aisles, department stores, and the modern home – in ways that mimicked the look and feel of mass-produced items. The hallmarks of their style came directly from the realm of commercial art: smooth surfaces, bright colours, a flattened perspective and graphic treatment of imagery. The slick, billboard-like style of James Rosenquist is a perfect example. However, a number of artists associated with the movement adopted a more idiosyncratic approach, emphasising the tactile and handmade. The ‘cool’ character of American pop art had a certain ambiguity. Some critics read the work as a celebration of popular culture, while others saw it as a critical commentary on how consumerism and mass media were reshaping the American way of life.